This board has gone red! The red cousin is similar but with a few DFM (design for manufacture) tweaks including a reflow compatible battery. We're clearing out the older black version so get them while they're at a discount! 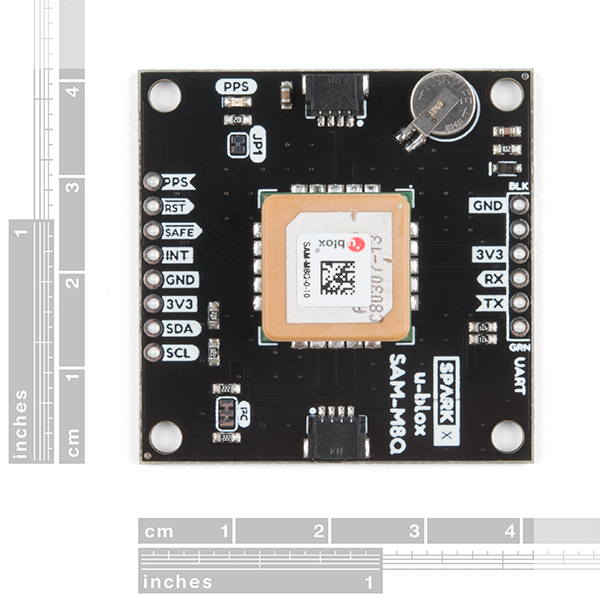 Ublox makes some incredibly sophisticated GPS receivers like the NEO-M8P. The SAM-M8Q is just as high quality, with equally impressive configurability, with a much lower price point. We broke out the basic pins and added all the supporting circuitry to make it even easier to use. Additionally we've mounted the M8Q on a large ground plane to maximize reception quality. The M8Q is a GNSS receiver meaning it can receive signals from the GPS, GLONASS, Galileo and constellations. This increases precision and decreases lock time. And thanks to the onboard rechargeable RTC battery you'll have a GPS lock within seconds! 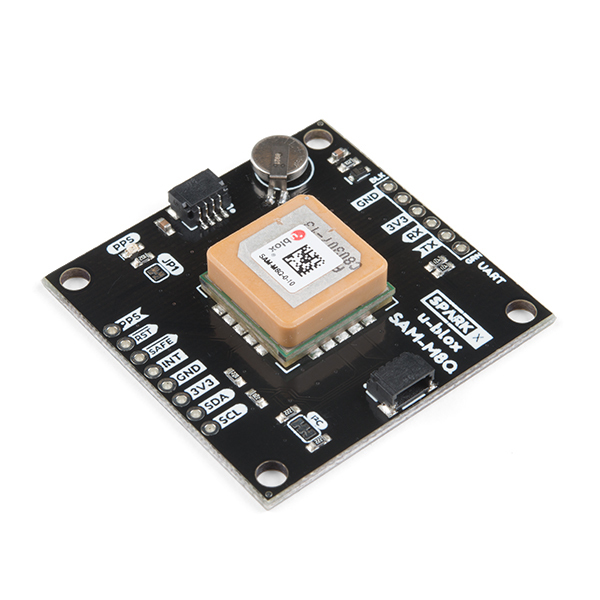 Additionally, this Ublox receiver supports I2C (Ublox calls this Display Data Channel) so you can use the SparkFun Ublox Arduino Library to connect to this device over Qwiic and leave your serial port open! No more using Software Serial for GPS parsing! Why buy this product over our Qwiic Titan X1 based product? Ublox based GPS products are configurable using the popular, but dense, windows program called u-center. 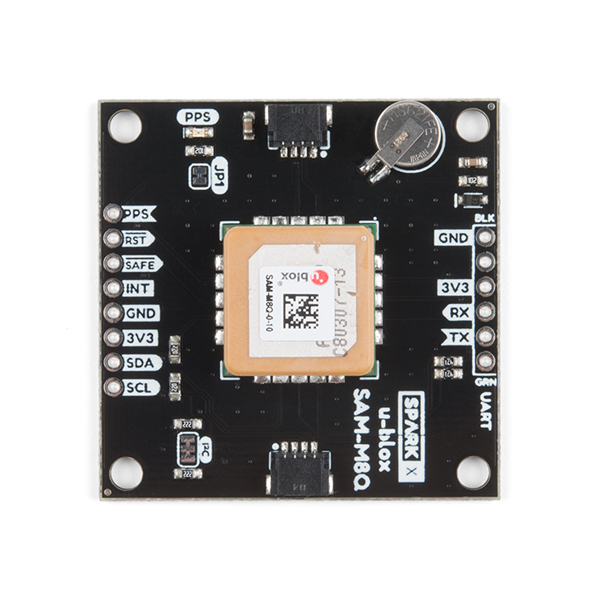 All sorts of things can be configured on the M8Q: baud rates, update rate, geofencing, spoofing detection, external interrupts, SBAS/D-GPS, etc. The SAM-M8Q has a huge number of features whereas the Titan X1 has many similar features but without the easy-to-use software that u-center provides. Don't worry, we've got a tutorial showing how to get started with Ublox u-center. 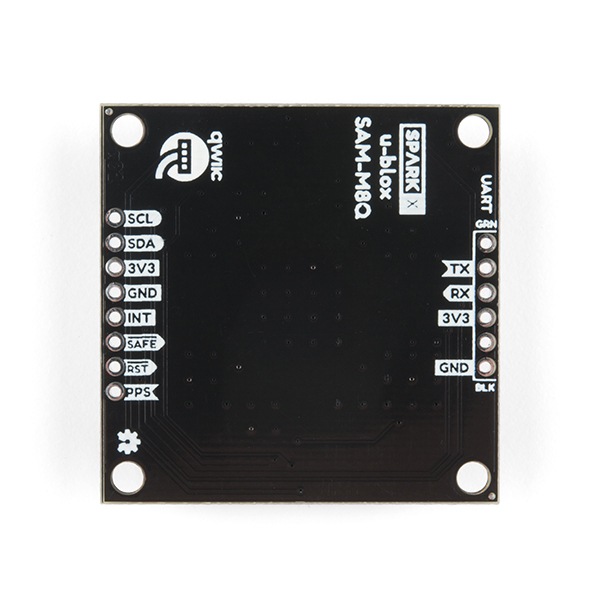 The Qwiic Breakout for the SAM-M8Q has two Qwiic connectors for easy I2C access and the omnipresent 'FTDI' style connector for any USB to Serial connection (we recommend the Serial Basic). You'll want the USB to serial connection for configuring the module. We recommend using I2C to receive the NMEA sentences but you can also use the RX pin to receive standard NMEA sentences at 9600bps. The onboard rechargeable battery provides power to the RTC on the SAM-M8Q. This reduces the time-to-first fix from a cold start (~30s) to a warm start (~5 seconds or faster). The battery will maintain RTC and GNSS orbit data without being connected to power for up to two weeks. SparkFun Ublox Arduino Library - This library can be installed via the Arduino Library manager by searching 'SparkFun Ublox'. The library is excellent for reading and parsing NMEA data over I2C.